BBC News - Newsnight - Why did UK not ban so-called 'bomb detectors' earlier? Why did UK not ban so-called 'bomb detectors' earlier? 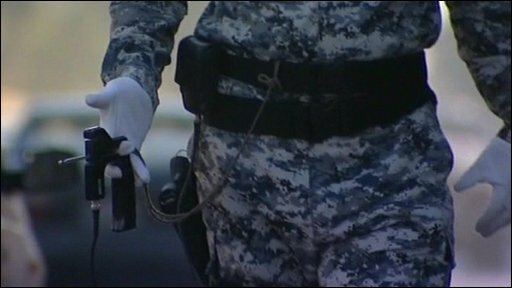 Questions are being raised about why the British government did not intervene to stop the export of useless "bomb detectors" such as the British-made ADE651 and GT200 earlier, before they were exported to Iraq, Thailand, Pakistan, China, Mexico, Kenya, Lebanon and many other countries. 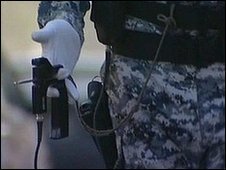 Following a BBC Newsnight investigation into the "magic wand detectors", which was broadcast on 22 January 2010, which showed that they had no functioning parts, Britain banned their export to Iraq and Afghanistan because they might endanger British or allied forces. They then issued a warning to governments around the world that they did not work. On Tuesday of this week, the Prime Minister of Thailand, Abhisit Vejjajiva, banned the purchase of any more GT200s after further tests in Bangkok showed they were no more effective than guessing where explosives might be. It has now emerged that the British authorities have been aware of the devices for at least 10 years and that the UK Foreign Office has been aware of concerns for a year. In January 2000, Gary Bolton who runs the company which makes the GT200 tried to sell an early version called the Mole to British customs. He even demonstrated it to search teams at Heathrow airport as a drug detector. It failed to find a large sample of cocaine at a range of less than one metre, but no scientific tests were carried out. In 2002 the Mole was tested in a thorough double blind trial at the Sandia National Laboratories in the United States, which found that it was incapable of detecting explosives. As in all scientific trials of these "dowsing" detection devices they performed no better than random chance. Professor Bruce Hood of Bristol University has been campaigning against these devices which he describes as "a piece of plastic with a car aerial sticking out of it" and he says that after the Sandia trials in 2002 "at that point someone should have stepped in and shut this operation down". Instead hundreds of GT200s were sold to Thailand for a total bill of over $20m and more than a 1,000 ADE651s have been sold to Iraq. The Iraqi government has spent $85m on the devices which are used on most checkpoints and there are concerns that they have failed to stop bomb attacks that have killed hundreds of people. In January 2009 the Chair of the Defence Select Committee, James Arbuthnot MP, raised concerns about the marketing of the GT200 with Defence Minister Quentin Davies MP. The Foreign Office told the BBC that they also became aware in March 2009 that "concerns had been raised" about the ADE651 used in Iraq and started monitoring the situation, but they didn't warn the Iraqis until November 2009. Even then they did not tell them that the devices did not work - they just warned of the "possible risk to life of relying on these devices if they were indeed ineffective". 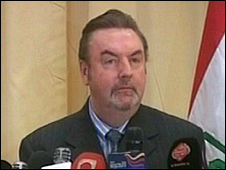 In late December 2009, Avon and Somerset police stopped a shipment of ADE651s and on 5 January 2010 they arrested Jim McCormick, the boss of the company which makes the devices, on suspicion of fraud. But it was not until after the BBC investigation was broadcast on 22 January 2010 that the British government imposed an export ban on the devices to Iraq and Afghanistan. And it was not until 5 February that they contacted other countries to warn that "the British government has serious doubts about the effectiveness of devices such as the ADE651 and GT200 at detecting bombs". The Liberal Democrat MP David Heath is outraged at all the delays and plans to ask Prime Minister Gordon Brown "why nothing was done to try to stop all this at the earliest opportunity and why other countries were not warned that these devices were quite frankly useless".